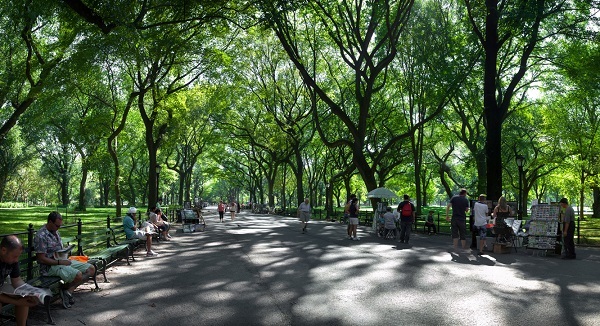 In this article, we talk with Ian Leahy, Director of Urban Forest Programs at American Forests, about urban tree canopy. We are encouraging every type of community, from the smallest towns to the largest cities, to consider the benefits of healthy trees. You'll find this enlightening. Useful Community Development (UCD): Ian, if our readers are not familiar with that term, can you please explain it? IAN: We use the term “urban” to reference any built environment. In that context, tree canopy is any area covered by the branches of trees. That includes sidewalks, homes, anything that hangs over the roofs. So the way we measure overall tree canopy is some sort of imagery, either satellite imagery, LIDAR, or just a flyover to get a picture of the area we are studying during full leaf-out, like in the summer. Then we go through and calculate the percent of tree canopy. But that’s only one rudimentary, initial means of measuring an urban forest. Then you have to get on the ground and measure such factors as age diversity, health of the trees, and what species, including invasives, you are dealing with to get a complete understanding of the urban forest. UCD: Right. 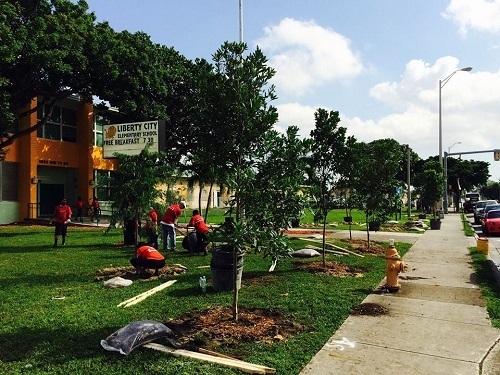 So why should a community care about its tree canopy? IAN: It is the only type of infrastructure that increases in value after you install it. Because it’s a living infrastructure, tree canopy is very unique, as opposed to street lights and roads and things that are at their best the day they are installed and then slowly deteriorate. But it also may be the only thing you can invest in that impacts such a broad spectrum of life. The obvious benefits are air quality and water quality – the ones a kindergartner might know. But more recent research has revealed a lot of interesting connections to improving academic performance in schools, reducing stress levels, increasing property values, public safety, and even helping with transportation, like increasing the life of asphalt and creating more walkability. There’s often conflicting perspective, especially in lower-income communities where some residents perceive green spaces as places where not the most upstanding residents will gather. But generally speaking, research has shown that a well-maintained tree canopy reduces crime rates. Research even shows that deaths--maybe not a large number of deaths, but some deaths--are reduced because of the presence of tree canopy. It’s not universal but generally speaking, wealthier communities have more tree canopy. It makes sense that if you have more money, you can put more trees in your yard. So it’s important that we create equity when we’re planting trees so that these academic, environmental and social benefits can reach more communities. UCD: So what are some secrets of creating a healthy tree canopy? IAN: I think the biggest secret is just supporting yourcity or town’s investment in planting, maintaining and replacing trees. Everyone loves planting trees, and so do I. But I’d also love to have ribbon cuttings for pruning limbs every seven years after. That’s not as exciting but taking care of trees at every stage of their life cycle is what urban forestry is all about. When you’re a city manager putting your budget together, it’s easy to see trees as window dressing far down the list from other priorities, so we really try make the case that it is actually a core infrastructure that communities of all sizes need to invest in. Once you have made that investment, the next important thing is having technical expertise for the long-haul. The most functional communities in terms of urban forestry are those that have certified arborists in the field every day able to pull up a single tree on their computer tablets and look at its history, how well it has been maintained, when it was planted, and its health issues. Just like a doctor, if you have a history of your patient you can better manage symptoms. You can also look across the entire spectrum of trees in your city with that data. That’s why we call them urban forests. At American Forests we try to look at the whole picture, not just planting a tree in your yard but overall systems management. When you look across the data you’ve collected over time, you can see such factors as age diversity, whether you need to increase one species or maybe decrease another one. You can see overall health of your forest, too, and whether you have vulnerable species like the ash tree that could be wiped out by disease. UCD: What should a smaller community, which doesn’t have the capacity to have an urban forester on staff, know about trimming its street trees? IAN: The beauty of an urban forest is that each resident can have an impact. You can’t put a streetlight in on your own, but you can plant and take care of a tree or ten and make a meaningful contribution. You can also organize volunteer events to turn tree planting into a bonding activity and get a large number of trees in the ground. That takes coordinating with officials, but many towns are happy for the help because they don’t have the resources to do it on their own. As a national nonprofit, we try to support communities of all sizes. The states are another resource smaller communities can turn to. There’s an urban and community forestry program in every state. 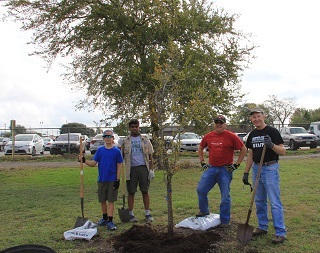 As for maintaining trees, learn what you’re allowed to do to public trees and what your responsibilities are for private trees in your community, but it’s a good idea to start training any tree when it’s young . After you plant it, you want to establish a central leader and remove any competing stems, remove dead branches and establish a strong structure to the branches. It gets harder as trees mature but you want to give it generally a seven-year maintenance cycle. That’s where the long-term investment and need for expertise comes in. We often talk a lot about how great trees are, but we really do have to acknowledge they are dangerous too if they are not maintained and even sometimes if they are. Maintaining trees, taking the dead limbs off, just making sure they are healthy and strong, really reduces the risk and increases the overall benefit. UCD: Let’s say that a community as a whole or a particular neighborhood is lacking in trees. Maybe they have had a hurricane or tornado, or maybe they are a new community built on a greenfield. Should they plant new trees all or once, or is this a gradual program? IAN: It should definitely be gradual. They used to plant everything all at once. This created that classic American element of beautiful arching tree canopy that defines neighborhoods. But all those trees were the same age and the same species, so when Dutch elm disease came through, it just devastated entire neighborhoods, from a completely covered street down to just nothing. So, just like a natural forest, you want to plant incrementally, plant diverse species. It doesn’t create that classic arching look as much, but it does create a much stronger, more resilient tree canopy. UCD: So what are the tradeoffs in choosing between fast-growing trees and slow-growing ones? IAN: Fast-growing trees tend to be the ones that grow the tallest. Urban foresters try to encourage large canopy species where appropriate but a lot of people like the smaller, slow growing flowering trees. The fast-growing trees tend to have a shorter life, and some of them are weaker. Some like the Bradford pear and the silver maple are notorious species. Any chance we get, we replace them with something sturdier because they are going to drop a lot of limbs and are just not very strong. But then there are sycamores and oaks —there are a lot of really good fast-growing species. You just have to recognize they might not live that long, particularly if they’re dealing with the stresses of an urban environment. UCD: Where could a community get good advice about its tree canopy? IAN: I’ll start with private arborists generally that you can call if you want to ask about specific trees. The International Society of Arboriculture has a list of certified arborists in each area. Contact the state urban and community forestry coordinator – each state has one- - if you don’t have a large population of arborists in your area. They, or a university cooperative extension program, can guide you. At American Forests we just launched the Vibrant Cities Lab. It synthesizes the latest research mentioned earlier, highlights best practices from communities of all different sizes, has a toolkit for how to build an urban forest program in your community, as well as tons of resources such as effective ordinances, technical guides and management plans. UCD: Thanks, Ian. Now our readers know how to approach building and maintaining a healthy tree canopy.